PA TV singles out female terrorists Dalal Mughrabi and Leila Khaled as worthy of particular praise on International Women's Day. The Palestinian Authority chose to mark this year’s International Women’s Day by honoring female terrorists. 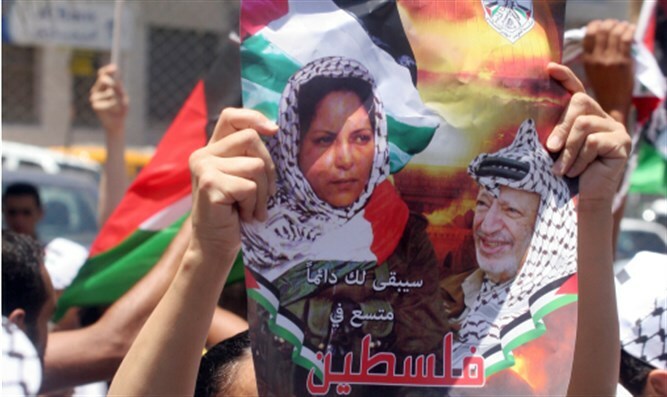 Official PA TV singled out female terrorists Dalal Mughrabi and Leila Khaled as worthy of particular praise. "Palestinian women have created a history filled with their resolve, with their strength, and [for] some of them - with [sacrificing] their freedom in prison... Through their Martyrdom-deaths Palestinian women have participated in chapters of struggle in the most prominent events in Palestinian history,” the host on Official PA TV said on the occasion of International Women’s Day, according to Palestinian Media Watch. “It will never be possible to review the struggle of the Palestinian women without [mentioning] the two self-sacrificing fighters Dalal Mughrabi and Leila Khaled - the first woman who hijacked an Israeli plane - as the most prominent names of the Palestinian resistance." Dalal Mughrabi led the most lethal terror attack in Israel's history, known as the Coastal Road massacre. In 1978, she and other Fatah terrorists hijacked a bus on Israel's Coastal Highway, murdering 37 civilians, 12 of them children, and wounding over 70. Khaled is a terrorist from the Popular Front for the Liberation of Palestine (PFLP) who was involved in a series of airplane hijackings which targeted Israel in the late 1960s and early 1970s. In 1969 she was part of a terrorist cell which hijacked TWA Flight 840 from Rome to Tel Aviv, forcing the plane to land in Syria. A year later, Khaled participated in the attempted hijacking of El Al Flight 219 from Amsterdam to New York. After the hijacking attempt was foiled. Khaled was arrested, but later released by British authorities following a subsequent hijacking.